These cute and inexpensive tin can decorations are perfect for a country themed wedding. Just clean ordinary tin cans and hot glue a square of styrofoam into the bottom, adding whatever silk flowers you choose. Wrap a length of ribbon of choice around the outside and hot glue overlapping ends, tie raffia around the lower part of can and make a bow with long tales. Take a length of ribbon and hot glue end to the back of one can and the other end to the back of the other can for your hanger. This is great just for decorating your backyard. Very cute! Now, that's just plain cute! SO CUTE!! MY MOM WILL LOVE THIS. 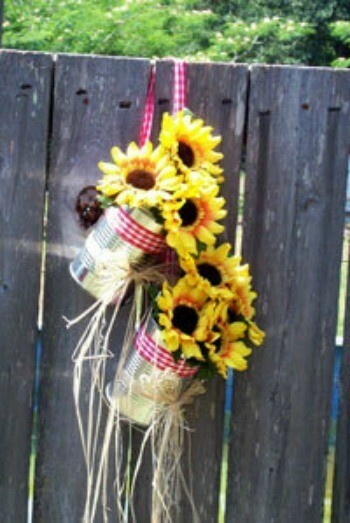 EASY ENOUGH AND AFFORDABLE TO MAKE..
Now finally a decoration that is just my style. I'm going to make these. Thanks for sharing and adding a picture. You can also use tin cans as little lanterns as well. Just punch a pattern on the outside of the can and then pop in a candle. Hang them off trees or place them on the ground. They'll light up your evening! Awesome! I would love to see a wedding that was decorated like this.